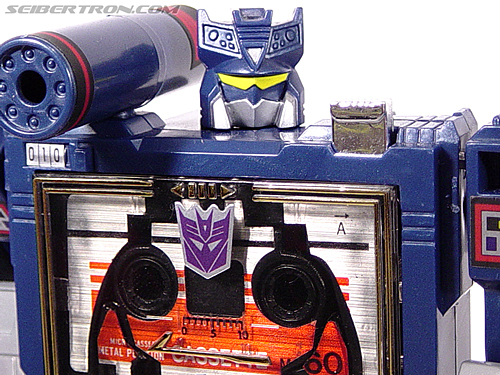 Profile: It is said that Soundwave can hear a fly sneeze. It is also said that beneath his smooth-talking, affable surface beats the generator coil of a blackmailer. Those who know these two facts about him are very careful about what they say within earshot of him. Soundwave is the ultimate opportunist and will use anything he can to advance his status in the eyes of the Decepticon Leader Megatron. He doesn't worry about what others think of him because he knows he is nearly indispensable. Although they all despise him, the other Decepticons pretend to like him rather than get on his bad side. As Rumble explains, "Soundwave always has the last laugh." Abilities: Soundwave's sensors can detect radio transmissions of the lowest energy levels. He can even "read minds" by monitoring the electrical impulses inside someone's brain circuitry, if he's standing nearby. He serves as the Decepticons' communications relay station- he can keep them all in radio contact with each other within a radius of 100 miles. His photographic memory is due to the immense information storage capacity of the magnetic disks in his chest. He carries a high-amplification directional radiowave sensor and a concussion blaster-gun. He also has great physical strength. The Transformers #7 - "Warrior School!" The Transformers #13 - "Shooting Star!" The Transformers #17 - "Return To Cybertron Part 1: The Smelting Pool!" The Transformers #18 - "Return To Cybertron Part 2: The Bridge To Nowhere"
The Transformers #22 - "Heavy Traffic!" The Transformers #25 - "Gone But Not Forgotten!" The Transformers #27 - "King of the Hill!" The Transformers #41 - "Totaled!" The Transformers #48 - "The Underbase Saga (Pt 2): The Flames of Boltax!" The Transformers #49 - "The Underbase Saga (Pt 3): Cold War!" The Transformers #50 - "The Underbase Saga (Pt 4): Dark Star"
The Transformers #71 - "Surrender!" The Transformers #72 - "... All This and Civil War 2"
The Transformers #73 - "Out of Time!" The Transformers #74 - "The Void!" Transformers (UK) #1 - "The Transformers"
Transformers (UK) #6 - "Prisoner Of War"
Transformers (UK) #7 - "The Last Stand"
Transformers (UK) #8 - "The Last Stand"
Transformers (UK) #14 - "The Enemy Within (Part 2)"
Transformers (UK) #18 - "Raiders Of The Last Ark (Part 1)"
Transformers (UK) #24 - "The Worse Of Two Evils"
Transformers (UK) #25 - "The Worse Of Two Evils"
Transformers (UK) #28 - "Repeat Performances"
Transformers (UK) #32 - "The Wrath Of Grimlock"
Transformers (UK) #36 - "The Next Best Thing To Being There!" Transformers (UK) #40 - "Prime Time!" Transformers (UK) #41 - "Christmas Breaker"
Transformers (UK) #49 - "Dinobot Hunt (Part 3)"
Transformers (UK) #51 - "Shooting Star"
Transformers (UK) #61 - "Devestation Derby (Part 1)"
Transformers (UK) #62 - "Devestation Derby (Part 2)"
Transformers (UK) #64 - "Second Generation (Part 2)"
Transformers (UK) #65 - "Second Generation (Part 3)"
Transformers (UK) #66 - "The Smelting Pool"
Transformers (UK) #67 - "The Smelting Pool"
Transformers (UK) #68 - "The Bridge To Nowhere"
Transformers (UK) #69 - "The Bridge To Nowhere"
Transformers (UK) #70 - "Command Performances"
Transformers (UK) #75 - "In The National Interest (Part 2)"
Transformers (UK) #76 - "In The National Interest (Part 3)"
Transformers (UK) #77 - "In The National Interest (Part 4)"
Transformers (UK) #85 - "Target 2006 (Part 7)"
Transformers (UK) #86 - "Target 2006 (Part 8)"
Transformers (UK) #87 - "Target 2006 (Part 9)"
Transformers (UK) #88 - "Target 2006 (Epilogue)"
Transformers (UK) #91 - "Heavy Traffic"
Transformers (UK) #93 - "The Gift"
Transformers (UK) #94 - "Decepticon Graffiti"
Transformers (UK) #102 - "Fallen Angel (Part 2)"
Transformers (UK) #107 - "Gone But Not Forgotten"
Transformers (UK) #108 - "Gone But Not Forgotten"
Transformers (UK) #111 - "King Of The Hill (Part 1)"
Transformers (UK) #117 - "Hunters (Part 1)"
Transformers (UK) #137 - "Ladies Night (Part 1)"
Transformers (UK) #138 - "Ladies Night (Part 2)"
Transformers (UK) #147 - "Legacy Of Unicron (Part 2)"
Transformers (UK) #151 - "Legacy Of Unicron (Part 6)"
Transformers (UK) #152 - "Enemy Action (Part 1)"
Transformers (UK) #174 - "Totaled"
Transformers (UK) #175 - "Totaled"
Transformers (UK) #181 - "Big Broadcast Of 2006 (Part 2)"
Transformers (UK) #184 - "Space Pirates (Part 3)"
Transformers (UK) #185 - "Space Pirates (Part 4)"
Transformers (UK) #186 - "Space Pirates (Part 5)"
Transformers (UK) #187 - "Space Pirates (Part 6)"
Transformers (UK) #194 - "Club Con (Underbase Part 1)"
Transformers (UK) #196 - "The Flames of Boltax (Underbase Part 2)"
Transformers (UK) #197 - "The Flames of Boltax (Underbase Part 2)"
Transformers (UK) #198 - "Cold Comfort And Joy"
Transformers (UK) #199 - "Time Wars (Part 1)"
Transformers (UK) #201 - "Time Wars (Part 3)"
Transformers (UK) #202 - "Time Wars (Part 4)"
Transformers (UK) #203 - "Time Wars (Part 5)"
Transformers (UK) #204 - "Time Wars (Part 6)"
Transformers (UK) #205 - "Time Wars (Part 7)"
Transformers (UK) #206 - "Cold War (Underbase Part 3)"
Transformers (UK) #207 - "Cold War (Underbase Part 3)"
Transformers (UK) #208 - "Dark Star (Underbase Part 4)"
Transformers (UK) #209 - "Dark Star (Underbase Part 4)"
Transformers (UK) #210 - "Dark Star (Underbase Part 4)"
Transformers (UK) #248 - "Fallen Star"
Transformers (UK) #261 - "Starting Over"
Transformers (UK) #275 - "Secret"
Transformers (UK) #277 - "Internal Affairs"
Transformers (UK) #279 - "Divide And Conquer"
Transformers (UK) #285 - "External Forces"
Transformers (UK) #286 - "The Lesser Evil"
Transformers (UK) #288 - "Front Line!" Transformers (UK) #292 - "The Legacy of Unicron (Reprinted 146 148)"
Transformers (UK) #293 - "The Legacy of Unicron (Reprinted 146 148)"
Transformers (UK) #300 - "The Legacy of Unicron (Reprinted 149 151)"
Transformers (UK) #304 - "In The National Interest (Reprinted 74 77)"
Transformers (UK) #306 - "In The National Interest (Reprinted 74 77)"
Transformers (UK) #311 - "Surrender"
Transformers (UK) #312 - "Surrender"
Transformers (UK) #313 - "The Enemy Within (Reprinted 13 17)"
Transformers (UK) #313 - "All This And Civil War 2"
Transformers (UK) #314 - "All This And Civil War 2"
Transformers (UK) #316 - "Out Of Time"
Transformers (UK) #317 - "The Void"
Transformers (UK) #326 - "Exodus"
Transformers (UK) Annuals #1985 - "Plague Of The Insecticons!" Transformers (UK) Annuals #1986 - "'Victory!'" Transformers (UK) Annuals #1986 - "To A Power Unknown!" Transformers Universe #3 - "RAM - SWI"
Transformers: Generation 2 #6 - "Tales of Earth (Part 3)"
Transformers: Generation 2 #6 - "The Gathering Darkness"
Transformers: Generation 2 #7 - "New Dawn"
Transformers: Generation 2 #7 - "Tales of Earth (Part 4)"
Transformers: Generation 2 #10 - "Total War!" Transformers: Generation 2 #12 - "A Rage in Heaven! (Part 3)"
Convention Comics #2000 - "Reaching The Omega Point"
Convention Comics #2001 - "Transformers: Wreckers (Part 1): "Departure""
Transformers #0 - "Prime Directives (Preview)"
Transformers: War and Peace #5 - "Chapter 5: Countdown To Extinction"
Transformers: War and Peace #6 - "Chapter 6: Revelation"
Transformers: Generation One #7 - "Infestation"
Transformers: Generation One #10 - "The Route Of All Evil"
More Than Meets The Eye: Transformers G1 #6 - "SIR - TAI"
Transformers - The War Within, Vol. 2: The Dark Ages #2 - "Escalation"
Transformers - The War Within, Vol. 3: The Age of Wrath #2 - "The Age of Wrath (Part 2)"
Transformers / G.I.Joe #1 - "The Line"
G.I.Joe vs Transformers #1 - "G.I.Joe vs the Transformers"
Transformers: Stormbringer #1 - "Transformers: Stormbringer"
The Transformers: Maximum Dinobots #3 - "Maximum Dinobots"
The Transformers: Maximum Dinobots #4 - "Maximum Dinobots"
The Transformers: Maximum Dinobots #5 - "Maximum Dinobots"
Transformers: All Hail Megatron #2 - "Transformers: All Hail Megatron"
Transformers: All Hail Megatron #15 - "Everything in Its Right Place"
Transformers: All Hail Megatron #13 - "Uneasy Lies The Head"
The Transformers: Megatron Origin #4 - "Megatron: Origin"
Transformers: Generations #1 - "Warrior School"
Transformers: Generations #2 - "Shooting Star"
Transformers: Generations #5 - "The Smelting Pool"
Transformers: Generations #6 - "The Bridge To Nowhere"
Transformers: Generations #8 - "Gone But Not Forgotten"
Transformers: Animated Movie Adaptation #1 - "Transformers Animated Movie Adaptation"
Transformers: Spotlight #6 - "Soundwave"
Transformers: Spotlight #10 - "Ramjet"
Transformers: Spotlight #11 - "Blaster"
The Transformers: Target 2006 #4 - "The Transformers: Target 2006"
The Transformers: Target 2006 #5 - "The Transformers: Target 2006"
Transformers: Timelines #3 - "Shattered Glass"
Transformers (Ongoing) #13 - "Transformers"
Transformers (Ongoing) #28 - "Transformers"
Transformers (Ongoing) #31 - "Pax Cybertronia"
Transformers: More Than Meets The Eye #3 - "LIars, A to D Part 3: The Chaos of Warm Things"
The Transformers: Regeneration One #81 - "Loose Ends, Part 1"
Revolution #1 - "Concorde Hymn"
Revolution #2 - "The Divine Source of Liberty"
Revolution #3 - "O Ship of State"
Revolution #4 - "The New Colossus"
Revolution #TAAO - "Revolution: Transformers: Till All Are One"
Revolution #5 - "Valley Forge"
Optimus Prime #1 - "New Cybertron Part 1: To Walk Among The Chosen"
Optimus Prime #2 - "New Cybertron Part 2: A Lonely Pillar On The Plain"
Optimus Prime #3 - "New Cybertron Part 3: Behind My Bleeding Back"
Optimus Prime #4 - "New Cybertron Part 4: Dance Among The Shadows"
Optimus Prime #5 - "New Cybertron Part 5: Future Glories Lost"
Optimus Prime #6 - "New Cybertron End: Feel Safe Without Regrets"
Optimus Prime #7 - "The Next Day and The Next"
Optimus Prime #8 - "What It's Really Like"
Optimus Prime #9 - "The Life of Sideswipe"
Optimus Prime #11 - "Primeless: Part 1"
Optimus Prime #18 - "The Falling, Interlude: The First Who Was Named"
Optimus Prime #23 - "Time Will Rust"
Revolutionaries #3 - "The Secret of the Mummy's Tomb"
Revolutionaries #7 - "When Eagles Scream"
Rom #5 - "Reinforcements: Chapter 1"
Hasbro Heroes Sourcebooks #3 - "Hasbro Heroes Sourcebook #3"
First Strike #1 - "First Strike #1"
First Strike #2 - "First Strike #2"
First Strike #3 - "First Strike #3"
First Strike #4 - "First Strike #4"
First Strike #5 - "First Strike #5"
First Strike #6 - "First Strike #6 and "Coda: The Signal""
3,698 pages were recently viewed by 546 unique visitors. This page was viewed 1 times on Wednesday, April 24th 2019 12:48am CDT. © 2019 Seibertron, Inc. DBA Seibertron.com. All Rights Reserved. Established June 2000. Seibertron.com is owned by Ryan Yzquierdo.